Lots of languages and vocabulary for your money! This page is a review of an electronic translator. Were you looking for...? The TG-450 is one of the more versatile members of Franklin's range of pocket translators and dictionaries. With support for 12 languages, the unit will in principle be suited to a wide range of potential users. But since this site is aimed primarily at students and teachers of French, this review will be biased a little towards the TG-450's support for French. We will see that the TG-450 is relatively well-suited to users of French and Romance languages, and less well to users of the other languages such as Russian and Turkish. 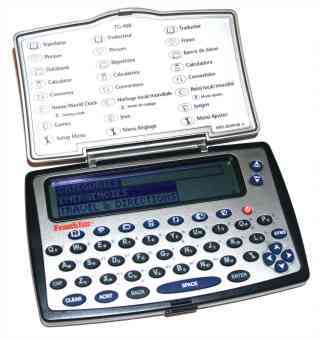 Conventional phrasebooks are ten a penny, and dictionaries exist for the plethora of other mobile devices that we carry around nowadays. So to be worthwhile, a dedicated language translator needs to be as simple and fast to use as possible. Generally speaking, the TG-450 is indeed simple to use. Once you have chosen your language pair, typing a word in the source language and pressing 'enter' provides you, after a short pause, with the translation in the target language as you might expect. There are no other options to set up: all possible matches for the word are searched at once. That means that matches for your word could come from the main dictionary, from inflected forms, from occurrences of words in the phrasebook, or from potential misspellings of words known to the machine. The time between pressing 'enter' to the translation appearing on the screen is generally acceptable (around a couple of seconds) but by no means instant. Sometimes your query will correspond to more than one entry (for example, a word that is both a noun and an adjective). In such cases, an intermediate screen will ask you to select which entry you require. And that's where the speed of the machine can become a slight issue. If you search for a word with more matches than the machine can display on screen at once (4 lines in "small character" mode), then after an initial pause of several seconds to display the list of matches, you may still need to scroll through the matches at an irritatingly slow pace to find the entry you want. Luckily, this issue is restricted mainly to a few common words (such as "make", "puis"). If price is more a concern and you don't need quite so many languages, then this 5-language translator may be more for you. 1. Type in the basic word to look up. 2. Where necessary, choose between ambiguous forms. 3. The definition is displayed. Although twelve languages are supported, the TG-450 is best suited to working with one language pair at a time rather than with multiple languages at once. Whilst in 'lookup' mode, you can switch the source and target language round at the press of a button. But changing to one of the other available languages is otherwise clumsy, requiring you to move to a separate configuration menu and then scroll slowly through the choice of available languages. An obvious but absent feature would have been a search across all the languages, for those situations where "I've seen this word in a foreign language but I don't know what language it is". Because the translator is equipped with a full QWERTY keyboard, entering words will be quicker for most users than entering on a device without a keyboard (such as a stylus-operated PDA). To enter accented characters, you type the base letter followed by the 'ACNT' key, which cycles through accented variants. Curiously, I found that certain characters could not be entered (e.g. û as in fût, or ë as in noël). Luckily, the spelling corrector still allows words requiring these accents to be found. For typing Russian words, each key of the QWERTY keyboard is assigned to a letter of the Cyrillic alphabet, though somewhat oddly the Russian letters are laid out alphabetically rather than in a standard Russian keyboard layout. All editorial content copyright (c) Javamex UK 2009. All rights reserved. All comments and material contained on this page are accurate to the best of the author's knowledge.